thanks! seem to work for now. i have lenovo z460. am a beginer in this field. 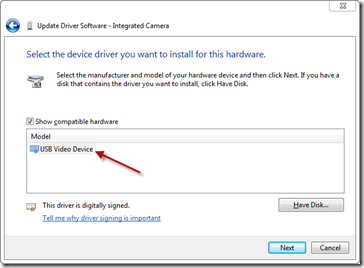 how can i open my webcam? I have an X200 and running W7 Pro and since I updated drivers with Lenovo tools (and thus installed Ricoh driver), camera started with strange behaviours (frozen images, image upside-down -yes really! -, quality loss..) resulting after some times with a black image.. 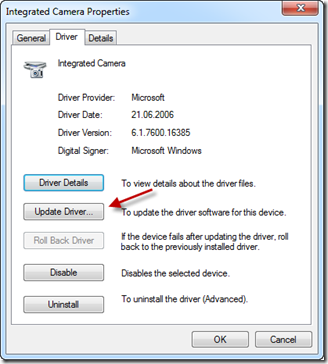 I have just tried to rollback with universal driver as you adviced and seems to work properly. Will come back to you after some time of use. 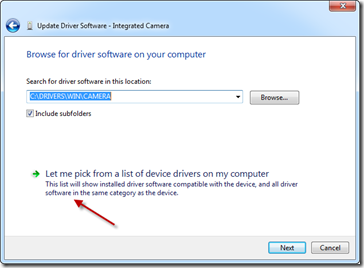 Hi, I do have the same Problem but my Webcam is not listed in the Device Manager – any suggestions? I do also have a X200 with Win 7 64 bit version. 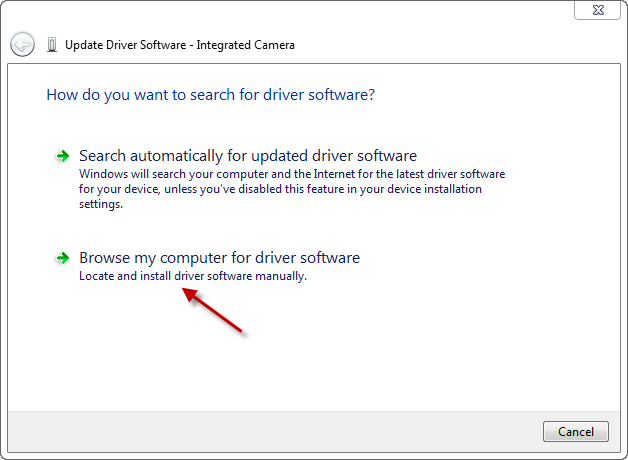 Like “Andy” I have NO device listed under “Imaging Devices” in Device Manager. I have used the camera in the past and after about a year, with regular system upgrades, it seems to have dissapeared. 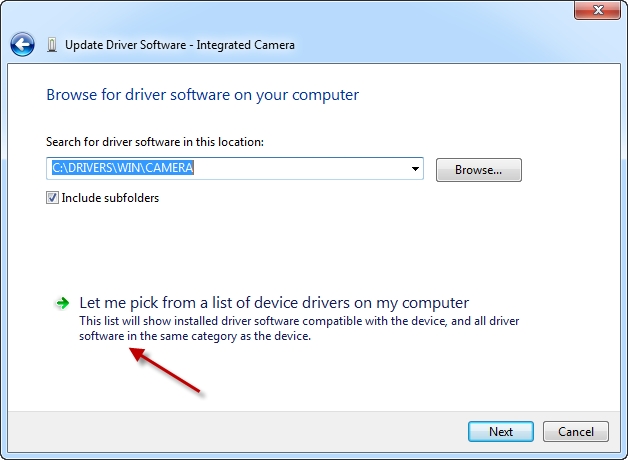 Like Andy & James, I have NO device listed in Device Manager under “Imaging Devices”. Happened after installing MS Office 2010 recently. I am on Windows XP Professional 32-bit. 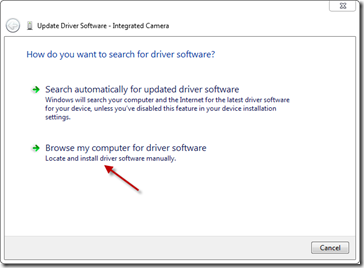 Have tried re-set BIOS to factory defaults, and installing updated integrated camera driver, but all fails. This is incredibly frustrating, and Lenovo unhelpful for this known issue. Any suggestions gratefully accepted – thanks! Maybe this will be useful for some of you: On some models or with certain software or bios versions you can turn on / off the webcam by pressing Fn+F6. It works the same way as turning on wireless network by pressing Fn+F5 – unfortunately lenovo does not print this onto the keyboard. Thanks a ton: Fn+F6 did the trick for me. I had no idea that function existed! You are a f’n genius. Have an x201 and the camera has nvever worked since the day I got the computer. Thank you!!! Reboot the computer. Press ‘F8′ during restart. 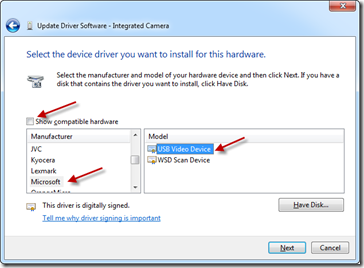 Select Disable Driver Signature Enforcement from the boot menu. This fixed the driver issue in my case but has to be done at startup every time to make the camera work!!! See security risk warning above. If it doesn’t work for whatever reason you can just remove loadoptions with bcedit and switch testsigning off. So I stumbled upon this site and replaced Lenovo’s faulty driver with Microsoft’s own buildt-in ones and voilá. Perfect match! 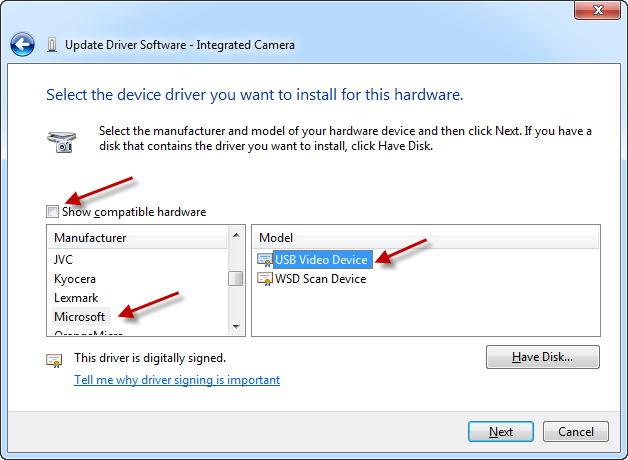 The camera on my brand new W520 wasn’t working and not showing up in the device manager (win 7 x64). Activating the camera with Fn+F6 wasn’t working either. Had to call Lenovo support. It turned out, there was a hardware issue and the camera had to be replaced. The technician said there was either an issue with the camera module or with the wiring. After replacing the camera, it showed up in the device manager and is now working as expected. 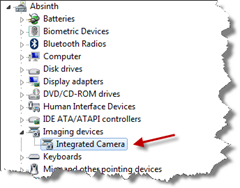 I had the ame problem on my Lenovo T410, when I upgraded from WinXP to Win7 64 Bit the intergrated camera stopped working. I serrched aand searche through forums and could not find a fix, I then tryed to reinstall the “ThinkkVantage Communication Utility” and WOW! it worked. Try it it may work for you. Had the same problem on my Lenovo W520 running Win7 64 Bit. 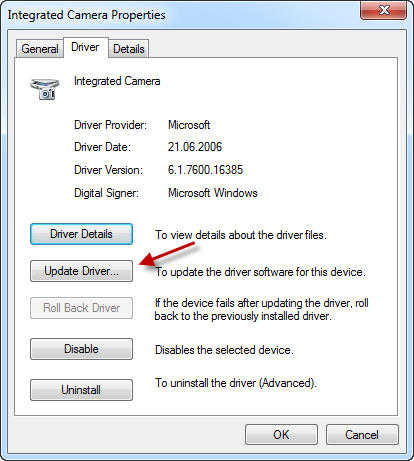 Tried different driver updates, but finally came to the conclusion that there must be a problem with the hardware. 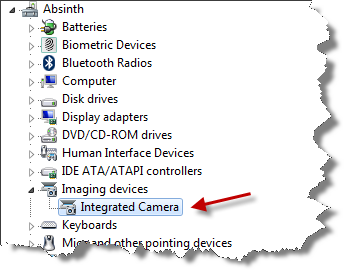 Had Lenovo change my integrated camera in the first place. After that, my camera worked, but it “disappeared” again, so I called the service center again. They replaced the wiring, too, and now the integrated camera is working sound and clear. I’m using the original Lenovo driver. Works great. 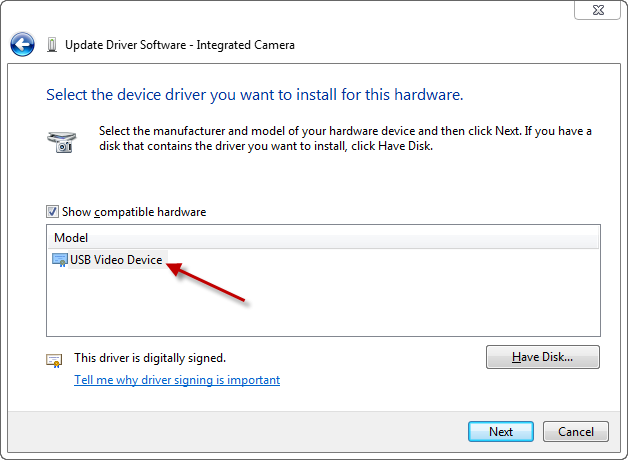 Only addition I have is that in Windows 7, to see the USB Video driver, first select Imaging Devices from the first list, then Microsoft, then you will find the USB Video driver. Thanks again for sharing this tip. thanks a lot.. as my issue is solved now. Thanks! It worked for my brand new X220 Tablet. Thanks a lot! It worked for me on a ThinkPad E520. rly great job! my fkn webcam made me fight on my windows 8 system (lenovo x230t) .. the clue.. i installed the OFFICIAL Windows 8 Lenovo X230T driver over and over.. and it did not work.. now .. with the windows driver it works! !